Can I Play Audible on Fitbit Ionic/Versa? Solved! Play Audible Books on Fitbit Ionic/Versa? Solved! There are more and more audiobook lovers who would like to play Audible books on Fitbit watch and they get votes on the Feature Suggestion of an Audible app for Fitbit on the Fitbit Community. Q 1: I'm looking for a smartwatch that is compatible with Audible books and I wish the next generation of the Fitbit Versa or Ionic can supports for audiobooks from Audible. Q 2: When Audible app for Fitbit will come out? Is there any opportunity to play audiobooks from Audible app? I would like to listen to stories and songs on my Fitbit watch. According to the official answer from Fitbit, there is no possibility of storing Audible audiobooks on Versa and Ionic but you can increase the chances of making it possible by getting your vote on. Are you disappoint to hear this answer? Take it easy! As a matter of fact, even if with no an Audible app available at launch, there is still an alternative workaround to listen to Audible books on Fitbit Ionic/Versa. You can read on this article to find the feasible approach. Although there is no Audible app compatible with Fitbit Versa and Ionic, Fitbit devices allow users to add audio files to their internal storage of 2.5 GB. Instead of playing audiobooks on Fitbit device via Audible app, you can transfer Audible files to this device and use the built-in music player to listen to Audible books. Speaking of putting Audible books on Fitbit Versa or Ionic, it's important to note that Audible audio files are protected by DRM technology, which leads that you can't transfer downloaded Audible files to Fitbit. Even if you can do that, audiobooks also can't be recognized by almost of music players. As a result, you'd better to convert Audible AA/AAX audio files to MP3 format and then add Audible MP3 files to Fitbit watch for playback. To convert Audible audiobooks to MP3, we can meet AudFree Audible to MP3 Converter, an all-in-one audio converter for Audible. 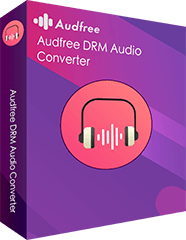 It is well designed to remove DRM protection from Audible books and convert them to MP3, FLAC, WAV, AAC, M4A and M4B with high quality preserved. One of the perks of using this software is that Audible Audiobook Converter can split audiobooks by chapters or fixed time frames. 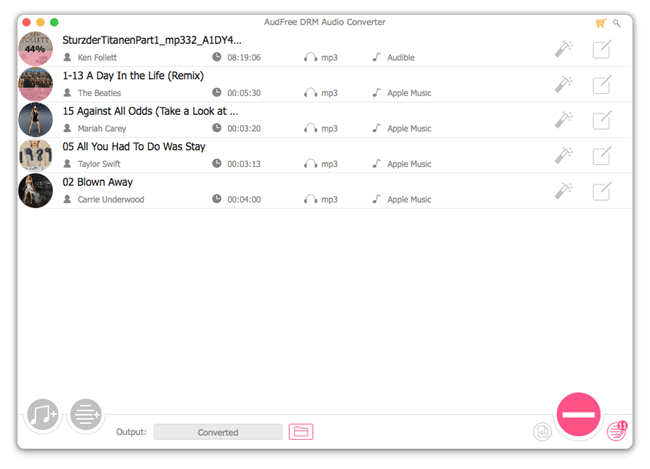 Losslessly convert Audible files to Fitbit supported files, like MP3, etc. Remove DRM from Audible, iTunes audiobooks, Apple Music, etc. AudFree offers the free trial version for all users to test its performance, which only has the time limitations to convert 1/3 of each audiobook. You can purchase the full version to unlock this limitation. Please make sure you have downloaded Audible files on your computer and upload them to iTunes library. And then you can launch AudFree software and click the '+' button to select favorite audiobooks from iTunes library to AudFree program. Alternatively, you can drag and drop downloaded Audible books to the main interface of AudFree. Now, it's time to customize audio parameters for Fitbit smartwatches. Please click the 'audio icon to open the setting window, in which you can start to set output format as MP3, FLAC, WAV, etc. change the bit rate, sample rate, audio channels, etc. And you can click the 'edit' icon to split audiobooks into smaller chapters and adjust the playback speed, volume, pitch as you like. 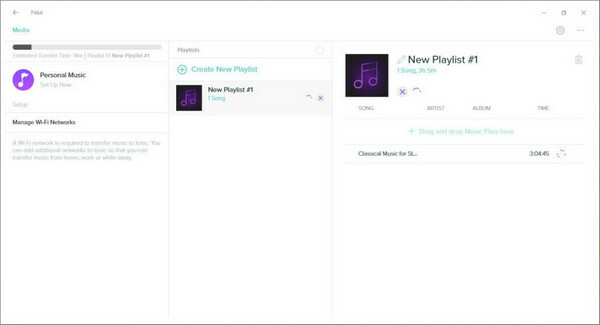 After all setting are ready, you can simply click the 'Convert' button to launch the converting process. 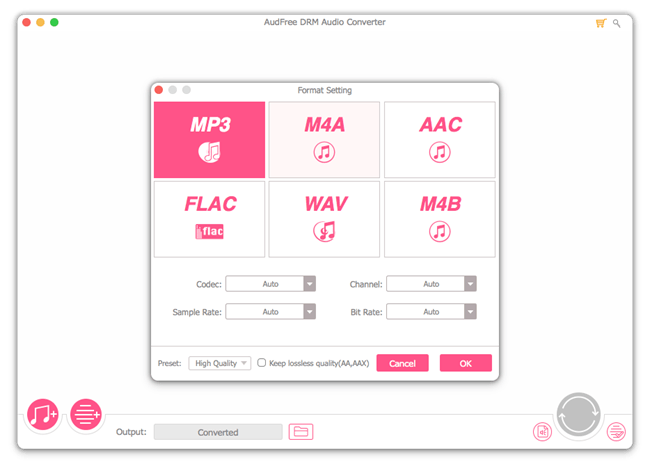 AudFree will automatically start to convert protected Audible AA/AAX files to MP3 in batch. It will run at 30X faster speed. But the true conversion time depends on how many audiobooks you have imported to. Step 1. Please install Fitbit app on your Mac or Windows computer and launch it to sing in your Fitbit account details. Step 2. Make your computer and Fitbit watch under the same Wi-Fi network. And then you can sync your watch in the Fitbit app. Step 3. In the Fitbit app, please click the 'Account' icon > Ionic/Versa title > Media > Personal Music button to locate Audible audiobook folder. Step 4. You can begin to select audiobooks that you'd like to listen to on Fitbit devices and then upload them to your watch automatically. Until the Audible app for Fitbit is available, you can use above way to play Audible books on Fitbit Versa and Ionic devices without problem. Now, you can start your audiobook trip on Fitbit smartwatch.